Today I’ll compare and lay down the differences between the two flagship watches of Garmin and Polar. The ForeRunner 920XT (which I’ve previewed here) and the V800 (my review here). The V800 was announced early 2014 and the 920XT on October 2014, so there is a bit of a gap in time, as you can also see from the specifications, but what is the best choice, most bang for your buck? Everybody has their own taste and the Polar V800 looks very sleek compared to the more classic (read: 80’s retro) digital watch style of the Garmin 920XT. So I won’t judge here, they both look very nice when worn as a normal watch when not doing any activities. The V800’s screen is just black and white, where the Garmin has a colors. Clarity wise, the Polar seems better to read and the colors on the Garmin are not as bright. Update: Garmin has a black/silver edition now too. Both watches can of course record the standard data; GPS, cadence, heart rate, power, etc. The difference here lies in how the watch obtains this. Garmin only supports ANT+ and the V800 only works with Bluetooth Smart. So if you are upgrading all your gadgets there is no worries, but if you are just changing the watch, keep this in mind. And for sensors, I expect the majority of sensors to support both BT and ANT in the near future, like the Wahoo Blue SC. 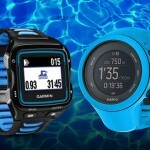 The Garmin 920XT has similar support for pool swimming, including drills. The Polar v800 has one strong point compared to the Garmin 920XT: It can show and measure your heart rate during swimming (with the Polar H7 hrm), and since the Polar Swim Software update (read more here), the other features are very comparable. 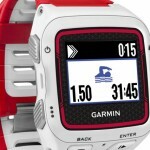 Both watches are able to measure your stroke count, distance, pace, SWOLF and identify in which style you are swimming. 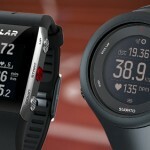 I do believe it’s a miss from Garmin, not to support heart rate, but that might come with a new HRM. Looking at the additional features, the 920XT is one step ahead, with support for kick and other drills in the pool and open water metrics, and I wouldn’t be surprised if Garmin releases a new HRM in 2015 or 16 which can do swim heart rate. The question is here what you find more important, heart rate or support for your drills. Polar has an active development team and swimming metrics for outdoor swimming is in development and was planned for March 2015 (so they’re a but late), but I do believe it will come. Future releases will also include new supported functions such as swimming drills, so in time Polar will catch up and Garmin should get that heart rate working. Measurements on the bike are practically identical and, besides power meters becoming more and more affordable, there hasn’t been much technological advance here in the past couple of years, so there are not real surprises here. Both watches use GPS, cadence and HRM via a chest strap. And both support power meters. However, as the V800 supports BTLE the majority of power meters are not compatible, however newer models will mostly support this, so unless you’e already invested in a power meter there is no clear choice. To get the best results (and support if something goes wrong) the V800 can be used with Look-Polar’s Power Pedal and Garmin has support for it’s own Vector models. Interestingly, the Polar V800 has the ability to measure and calculate your V02 Max, as does the 920XT, but the Polar test seems to be only for running. So overall, I’d say the 920XT wins the round, but it’s a very minute difference. The Garmin truly trumps the Polar in the running measurements. Where the Polar still requires a (quite large) foot pod (it’s one of a few Bluetooth foot sensors available), the 920XT is capable of measuring running cadence, vertical oscillation and contact time with the Garmin Run-HRM. Technically the V800 is capable of doing this too, but is a bit behind on their software development (or HR strap). 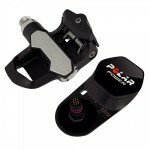 However, Polar is spending a lot of their time and effort on development to be comparable to the 920XT. Hoever I feel it’s current status is close to the 910XT, but don’t get me wrong, this isn’t bad. Finally, as stated above, when hooked up to a HRM, both watches can calculate your V02 Max and compare it to your age group competition, but this is more a table-lookup than a reliable lab-test. Both watches are excellent tools for a triathlete. It’s really up to personal preference on which watch you would want. When compared in weight, the 920XT wins, with a weight of only 61 grams it’s at least 20 grams lighter than the V800. The 920XT has an option to swap the wristband for a quick release wrist band allowing mounting on the bike, this is a nice addition for the more cyclists. Both watches support training planning, up to some level for swimming too. Garmin’s 920XT has WiFi itself and automatically uploads sessions to Garmin connect. Garmin’s 920XT has live tracking when paired with your phone (absolutely drains your phone battery though). 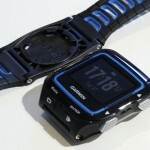 Overall the Garmin 920XT shows the gap in development between Polar and Garmin. However, Polar is catching up. Apart from the heart rate missing during swimming, there is no real difference any more between te watches. A slight plus might be the Garmin IQ third-party app development. However, in time, Polar can close the gap by developing the same features as the V800 is capable of almost everything the 920XT can, and it’s Dev Team is actively developing it’s software. If you like this comparison and want to buy either of these, please use one of the links below or a link to the shop from the sidebar. I get a small fee when you buy something, allowing me to keep doing this. 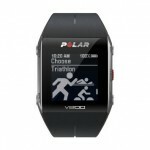 You can buy the Polar V800 with HRM for $329 onAmazon and for $359 on Amazon without the HRM. Price information: prices are localized where possible. I think you covered most of the important things. Few things for usability for the V800. Really clear and sharp display one can tap (touchscreen). No need to push buttons or even the screen when using the hearttouch (my fav. feature on my RCX5). I hate playing with buttons, when pushing it hard out there. There is a 920xt advantage that comes from being with Garmin Connect. The site is far more evolved and provides a link and data with MyFitnessPal, which automatically adjusts your numbers based on the workout download. Since nutrition is a big part of triathlon training, I think that is worth being mentioned. At this point, I must say that although the Polar is not as evolved it is available while the Garmin 920 is not. It may not be available until December. By that time, the Polar V800 will have android/iPhone support, swim matrix and frankly, it is more wearable on a daily basis and various situations than the Garmin that for all its capabilities is a cheap looking watch. I have both polar and garmin products and they are both connected. I think garmin has some technical advantages but polar can do HR in the water and for a one hour swim in open water, that matters. The V800 screen is absolutely crisp and seems to have a much higher resolution than the garmin and the screen on the V800 is made of very good scratch resistant glass. Which is more than I can say for the garmin. I think both watches will prove, yet again, that it is not about the equipment but the training. Both of these watches can help a triathlete get to Kona. My question: Why just 1 hour swim? what happens after? Nice review of strengths and weaknesses (920 seems quite impressive) of both watches. I have the V800 since june, and just love it. Nevertheless, to find a bluetooth power meter or a home trainer compatible with bluetooth is so limited compared to Ant+, but again, this point will evolve in the good way in the near future in order to saty in touch with the smartphone market. guerllamo7: matter of taste. I just don’t like the garmin connect website. When I was on the market for a watch, I tested both Polar Flow and Garmin Connect, and GC is so messy, although maybe more complete. Only thing I appreciated, the ability to use different colours for different activities, a nice touch lacking in the Flow website. But I agree with you about the ability of Polar to prgress through updates. The swimming update is really a nice upgrade (and definitely needed for a triathlon watch). Final thoughs: both are great, take the one you prefer. If you want pure efficiency, 910 is still a bargain. Have you had a go with it yet? I have both and just switched back to using the V800. 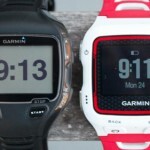 The Garmin feels cheap – and using it as your main watch makes you look like a dork with a cheap plastic watch. The V800 is more stylish. :). The 920XT screen is nowhere as readable as the V800. The screen on my 920XT is pretty unreadable with very washed out colours. The V800 DOES have step/activity counter with “time to move” alarms.. The Connect website is terrible IMHO. The Polar Flow website is only SLIGHTLY less terrible. iOS app’s for both are not great. GC updated my Apple Health data multiple times with the same data…. Polars Flow Bluetooth sync to iOS did not work from iOS 8 launch until last week. Both products and integrations are very ” unfinished ” and have plenty of bugs + lots of Sync/Server downtime. Explain to me how I´m supposed to use the swim function (regarding heart rate and intensity) in a pool, without using a wetsuit or a women suit? The real life application of this function is extremely under developed. Any serious swimmer knows that a chest worn monitor never sits in place at all through flip turns, stream line and the actual swimming. Can´t understand that we as users accept such lame functionality. Not to mention actually having to wear a watch while swimming, which is also something a real swimmer never would do. Well, I agree the chest strap staying in place may be an issue (I had similar issues with the Wahoo Tickr). Most Triathletes, when in wetsuit, wear it under the wetsuit and just press the start button during a race. For training purposes, it’s just nice to know what distance you’ve done, what your swolf is and what pace your intervals were at. It is a whole lot easier to do this on a watch than to write it down and having it digital will allow it to see your progress over time. So having the metrics is an absolute plus, the more supported features (e.g. drills, breaks), the more accurate your metrics. I looked a long time article who can actually show me the deferent! Very nice article, u answer all my questions. Now I can go to buy a watch!! All garmin watches look so cheap. U look at marketing pictures on the Internet about the watches displays, colors etc but the reality is different.. Even the fenix 3 sapphire is a peace of rubbish in realize.. All made of plastic, looks so cheap.. Really if u putting that on with a suit u gonna a be laughed at..
What about syncing in general? i have a Polar M400 and a Garmin Edge 500, the sync for each device is completely different. The Garmin takes 5 seconds and is always trouble free, the Polar device ALWAYS has to sync everything and takes 15 minutes, unless it fails and you start over. It makes me wonder how the higher end of devices compare. Just to clarify, my Polar has been sent back for service and is apparently operating normally.